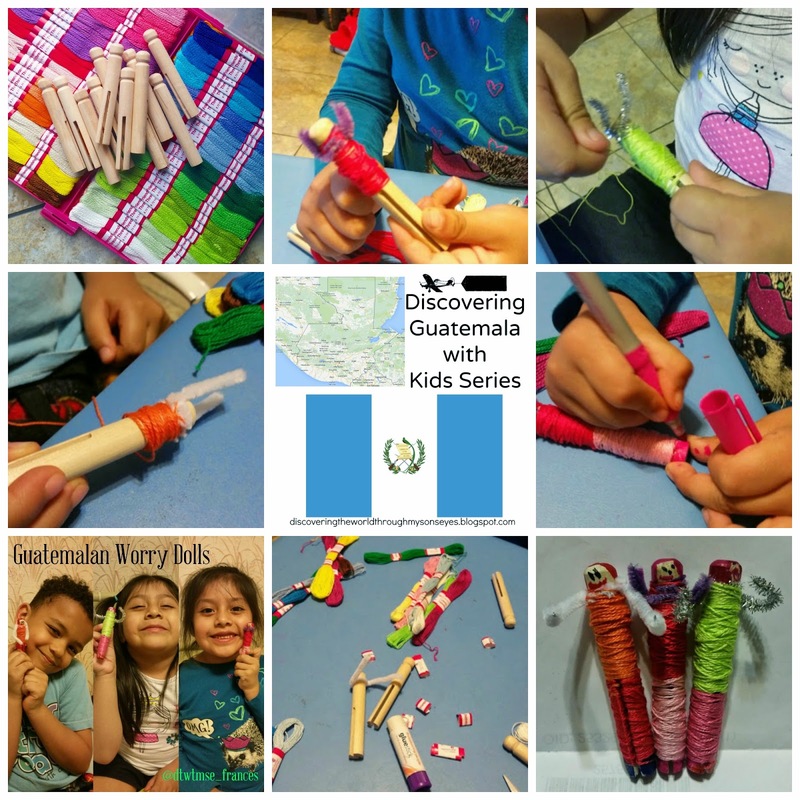 As part of our Discovering Guatemala with Kids Series we made the Guatemalan worry dolls also known as muñecas quitapenas in Spanish. They are traditional Guatemalan toys, and according to legend children tell one worry to each doll when they go to bed at night and place the dolls under their pillow. In the morning the dolls have taken their worries away. I followed the instructions on how to make the worry dolls from Creativity in Motion. She has a step-by-step picture instructions that was very helpful. I bought wooden clothespin, colorful yarn, and I already had the pipe cleaners. The kids were indeed excited to make them, but after wrapping the yarn halfway they got tired. 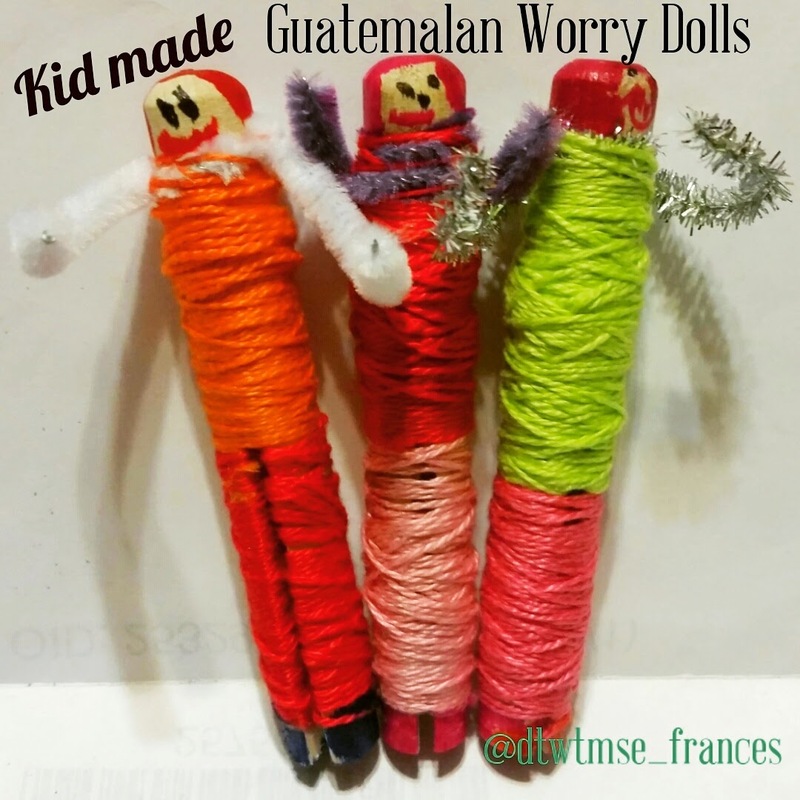 (So I suggest this activity for older kids) They each picked a color and made their worry dolls. My son made one with pants because it was a boy, and the girls made theirs with skirts. Cute! You can also try making the worry dolls entirely of pipe cleaners (chenille stems) click here for the instructions. We’ve been having so much fun learning about Guatemala! Our next post in the series is about the authentic Guatemalan dresses!